The setup: a giant, absolutely giant bit of grapevine in Gloria's garden, strangling the fence and quite a few paying customer plants. The grapevine resides just beyond our back fence, in a small gap between a riot of fences. #2 Those hooks? A boat ladder. #3 Gloria, although I failed to capture her hat in the picture. It's somewhere in the #3 circle, though, just out of view. As is Gloria. 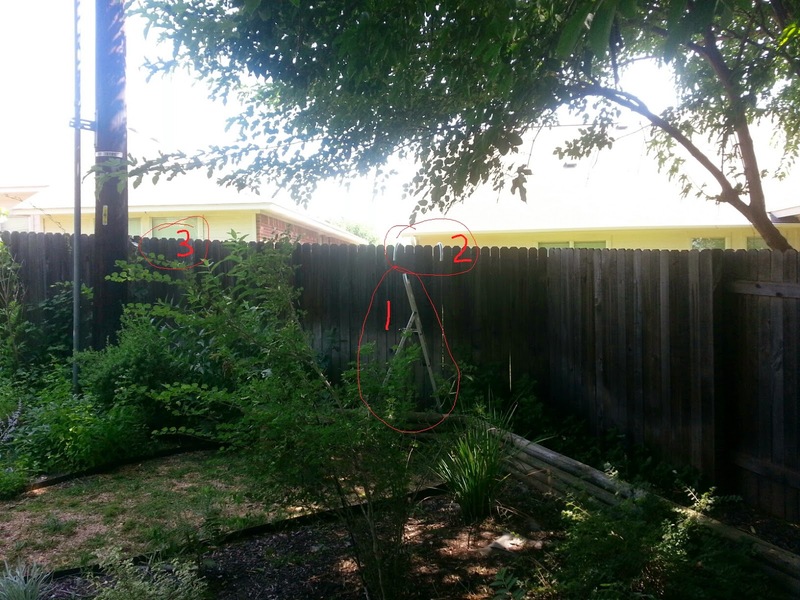 --put ladder on this side of fence. --climb ladder while carrying boat ladder. --put boat ladder on other side of fence. --climb from regular ladder over fence onto boat ladder, thus escaping into the between-fence jungle. --attack the unholy overgrowth. Repeat. Repeat. I've been on the other side of that fence, a decade ago. Bad things. Very bad things.